Actually, I think we should order our content by "neighborhood" on a much larger scale—Brooklyn needs to have a districts breakdown. Wikipedia tells me that, were it a separate city, it would be the fourth largest in the United States. So trying to cram the whole borough into one page seems to me untenable. Once we have a districts structure in place, we can then order the listings by price within the individual district articles. Of course, breaking cities into districts isn't all that easy. Most recently, we've been trying to do this with Philadelphia, so if you are interested in getting the ball rolling on a districts breakdown, take a look over that discussion to see how we'd go about this. Washington, D.C.#Districts is a pretty good example of a completed districts breakdown. Alright, I whipped up a map of Brooklyn's neighborhoods, which should make it easier to get down to a real districts discussion. 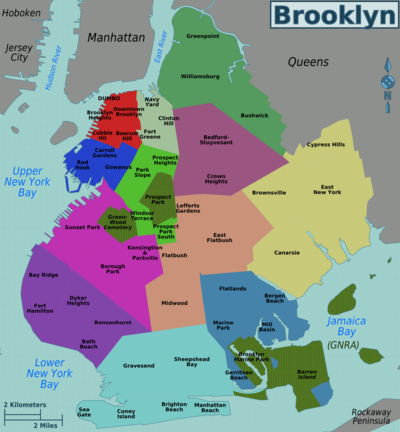 I don't know half enough about Brooklyn to create a full proposal, but I will propose a couple districts that I'm at least somewhat familiar with. 1) Brooklyn/Williamsburg (Williamsburg, Greenpoint). I think Williamsburg as I've drawn it (which amalgamates the various North/East/West/etc. Williamsburgs) could sustain a full, good travel article. Greenpoint by necessity would have to be added to the article, as it otherwise would be cut off from the city, and I don't think it would have enough content for a good travel article of its own. 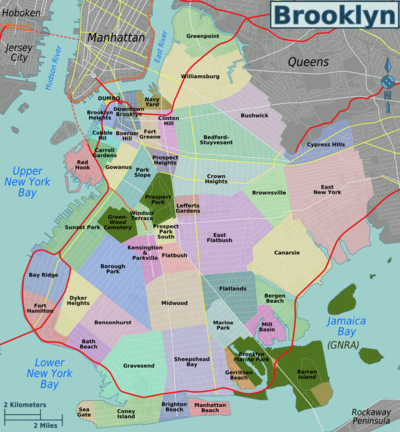 2) Brooklyn/Brighton Beach (Brighton Beach, Manhattan Beach, Sheepshead Bay). My favorite part of the city, where I can find my beloved Russian, Georgian, and Central Asian dishes! I think this would fill out a good article, but if it does not, we could combine it with either neighborhoods to the east, or with the third district proposed below. 3) Brooklyn/Coney Island (Coney Island, Seagate, Gravesend). I'll confess, I don't know this area—just the amusement park. Brooklyn/Flatbush and Midwood encompassing Midwood, Flatbush, East Flatbush, Lefferts Gardens, and maybe Prospect Park South. I hope you don't mind my intruding and adding those numbers to the list, but I think it will help us discuss. On the whole this looks great, so a big thanks is in order for drawing this up! As I said above, I don't know that much about Brooklyn to be a very competent judge, but I do worry that twelve might be a tad too many. In particular, if we create these districts now, we'll have a bunch of empty articles. Accordingly, it might be best to group some of them into larger chunks that could be broken down in the future if need be. On a more fundamental level, all district articles we create should be able to support a good travel article, which would ideally have at least 7 or so listings for the see section, eat section, drink section, etc. That's a rule that we should only break when there is a compelling reason. 3. Anything I know about this area is very outdated, but I wouldn't have thought there would be that much to see/do. Am I wrong? I don't know that there would be anywhere good to merge it to, though, so perhaps it's best left as is. 5 & 6. Merge into a West Brooklyn article? 8, 9, 10, & 11. My hunch is that these groupings, while certainly coherent, might not produce good travel articles (at least for some time). If I'm right, then the question becomes how best to merge them together, or with other areas. Bed-Stuy has a lot by way of attractions, but it's still a tempting target to merge with some surrounding areas. I don't think either Flatlands or Canarsie and East will be able to support good travel articles (at least without the help of an expert), so here's a wild idea: merge them, call it Jamaica Bay, and split off Brownsville to Bed-Stuy. 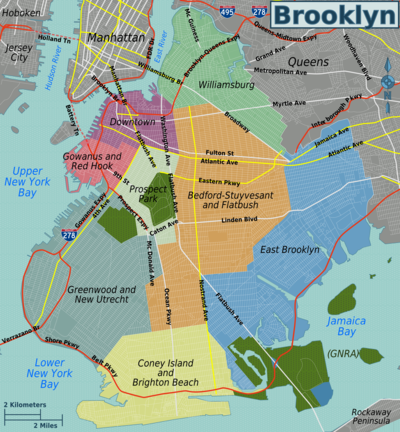 Then combine Bed-Stuy and Flatbush into one district article: Brooklyn/Bedford Stuyvesant-Flatbush. I can't say the areas have all that much in common, although they do bleed into one another, but they are complementary—Bed-Stuy has the sights, Flatbush has the eats. 12. Agreed, too small. Could it be added to the Downtown article as a sort of hinterland? Or would that mess up the Downtown article? If so, I don't have any good ideas of what to do with it. All very good ideas in my view. On number 12, I'm thinking merging it with Downtown, even if it is something of a hinterland relative to downtown. I'd say merge it with Williamsburg, but you seem to have that article covered (which is good, as I know next-to-nothing about the border areas), and it would create a really ugly and artificial district. If we think there's enough stuff to support it's own article, we can split it off. On 3: as a Brooklynite, I've definitely alwyas thought of Red Hook as quite distinct, not sure why though. It doesn't really make much sense to merge it with either the 2 or 4, since both are quite attraction-dense already, and also because the "stay safe" situation in Red Hook is very different from the other two districts. My thoughts would be to look up some of the artworks and fill the district with that. I do believe there is plenty to do, but it's not well known. On 5 and 6: I agree, we can merge into one article, but let's maybe call it Brooklyn/Greenwood and New Utrecht as that a. gives us a mind to a potential future split, b. keeps the coherence and c. still puts in the regions' name the reason most people would visit it: Greenwood cemetary. I agree with the Bed-Stuy-Flatbush proposal. I also agree with the Jamaica Bay Proposal but I would probably call it Brooklyn/East instead: I'm wary of calling it Jamaica Bay since there has been discussion (though unlike with Brooklyn, no action) on districtifying Queens, which might cause confusion. And since there's little chance this district would be split up, I dont think we should have a name with the format "a and b"
This page was last edited on 25 July 2011, at 08:33.